The overall objective of this study is to analyze long term patterns of S. aureus colonization and infection of swine veterinarians. 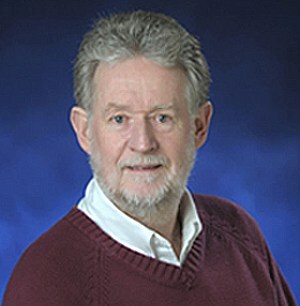 The study will include both methicillin resistant (MRSA) and methicillin susceptible (MSSA) strains of S. aureus, which will be typed to determine whether they are livestock associated strains. 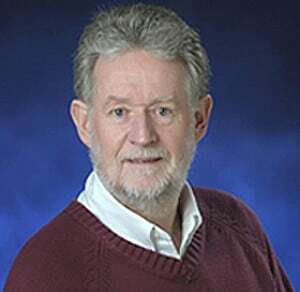 Concurrently, a survey of occupational hazards for US swine veterinarians and current practices for risk reduction will be conducted to assess of current practices in relation to existing recommendations and guide educational efforts to promote better practices for veterinarians and other groups who are occupationally exposed to animals. Determine the incidence and prevalence of nasal colonization of swine veterinarians with S. aureus (including MRSA and MSSA) in the USA. It is well established from cross-sectional studies that people with occupational exposure to livestock (particularly pigs and cattle) have a high prevalence of nasal colonization with MRSA. There is little information on the duration or stability of colonization, or its association with clinical staphylococcal infections. We will conduct a prospective study of a cohort of swine veterinarians to describe temporal patterns colonization with livestock associated MRSA and MSSA in a cohort of veterinarians over 18 months. Determine the incidence of occupationally related health events in US swine veterinarians, focusing on skin and soft tissue infections. Despite the high prevalence of exposure, there are no published prospective studies evaluating the clinical implications of exposure to livestock associated S. aureus. This is a critical gap in understanding of the public health implications of livestock associated MRSA. As part of a broader study of occupationally related health events in our study cohort, we will focus on the incidence of skin and soft tissue infections. Describe use of personal protection practices of US swine veterinarians. Current practices of swine veterinarians to prevent exposure to zoonotic agents are not well documented. We will assess attitudes and practices of veterinarians about perceived occupational risks of infectious diseases (including MRSA) in a broad cross-sectional survey as well as in the study cohort. The findings may be used to guide development of educational materials for veterinary graduates and students, as well as other livestock workers. Quantify associations between risks of colonization/ infection of swine veterinarians with MRSA/MSSA and exposure to pigs and use of PPE. Associations of exposure to pigs and personal protection practices of veterinarians with nasal colonization with MRSA and MSSA will be explored using data from Objectives 1, 2 and 3 to identify potential risk factors for interspecies transmission. Public health concern about the emergence of methicillin resistant Staphylococcal aureus (MRSA) in livestock, particularly pigs, is increasing. However, there is limited scientific information on the importance of livestock associated MRSA in human populations. The overall objective of this study is to analyze long-term patterns of S. aureus colonization (both methicillin resistant (MRSA) and methicillin susceptible (MSSA) strains) and infection of swine veterinarians. 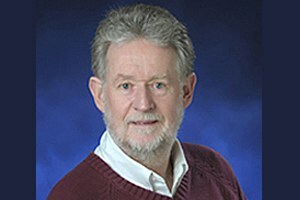 Concurrently, a survey of occupational hazards for US swine veterinarians and current practices for risk reduction is being conducted to assess current practices in relation to existing recommendations and guide educational efforts to promote better practices for veterinarians and other groups who are occupationally exposed to animals. The project will terminate in September 2014, and is in the final stages of analysis and reporting. A study cohort of 68 swine veterinarians across 15 states was recruited to participate in a longitudinal study to determine the incidence and prevalence of nasal colonization of MRSA and MSSA. Compliance with sampling was outstanding (over 98%) yielding 1768 S. aureus isolates (including 207 MRSA). Monthly prevalence of S.aureus (58.3% to 82.4%) and MRSA (5.9% to 15.2%) exceeded US population estimates, and the predominant variants (MLST sequence type/spa type) detected were ST398/t034, ST5/t002 and ST9/t337 which similarly predominate among US pigs, suggesting that they are commonly contaminated with S. aureus from the swine population. The prevalence of MRSA was much lower than an estimate of 44% reported in a similar Dutch study, and remained relatively stable throughout the study. Most veterinarians are intermittently and transiently colonized, but a substantial minority (about 20%) appear to be persistently colonized. Furthermore, the data indicate that the nasal staphylococcal flora of swine veterinarians are predominantly of animal origin. A broader online survey of occupational health in swine veterinarians to determine the occurrence of occupationally related health events yielded 180 responses which are currently being analyzed to assess the personal protection practices of US swine veterinarians. This will include analysis of associations between risks of colonization/infection of swine veterinarians with MRSA/MSSA, exposure to pigs and the use of personal protective equipment. This project will provide the first longitudinal assessment of the risk of human colonization and infection with livestock associated MRSA and its association with animal contact and personal protection practices. Issue Brief from the University of Minnesota Food Policy Research Center. Davies PR. Livestock Associated MRSA: What are the risks to human health? 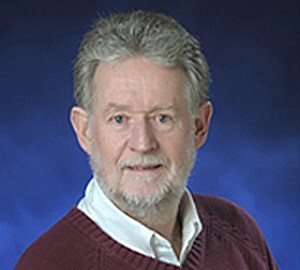 Proceedings, Allen D. Leman Swine Conference, pp. 153-157. Saint Paul, MN. Sept 23-25, 2012. Davies PR. Livestock Associated MRSA – Tiger or Pussycat? American Public Health Association (APHA) 140th Annual Meeting. San Francisco, CA. Oct 27-31, 2012. Davies PR. Webinars for UMASH study participants. Webinars for UMASH study participants. Web. Nov 7-13, 2012. Davies PR. 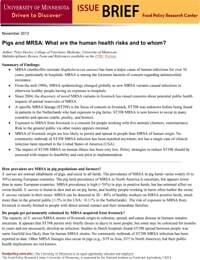 Emergence of livestock associated MRSA – occupational and public health consequences. 9th Annual One Medicine Symposium. Durham, NC. Dec 5-6, 2012. Davies PR. Research Update – Livestock Associated MRSA. American Association of Swine Veterinarians. San Diego, CA. March 2, 2013. Davies PR. Longitudinal study of Staphylococcus aureus and MRSA colonization of US swine veterinarians. UMASH Annual Forum. Saint Paul, MN. April 17, 2013. Davies PR. 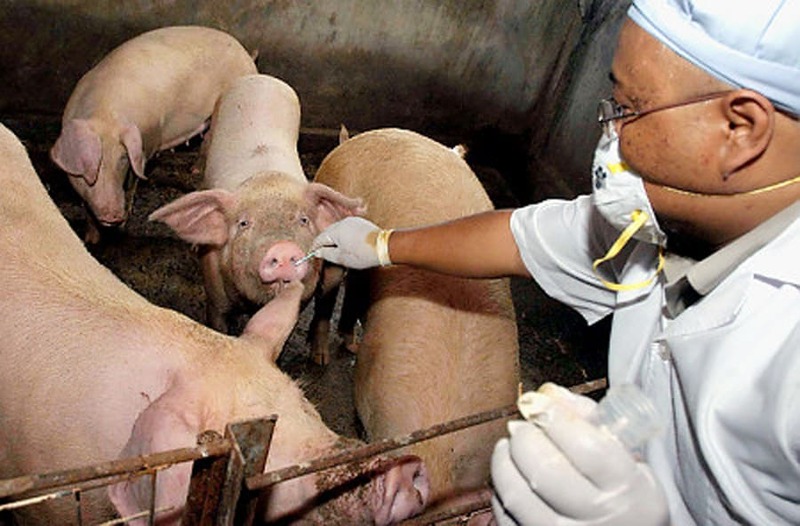 Survey of occupational health risks and protective practices of US swine veterinarians. UMASH Annual Forum. Saint Paul, MN. April 17, 2013. Davies PR. 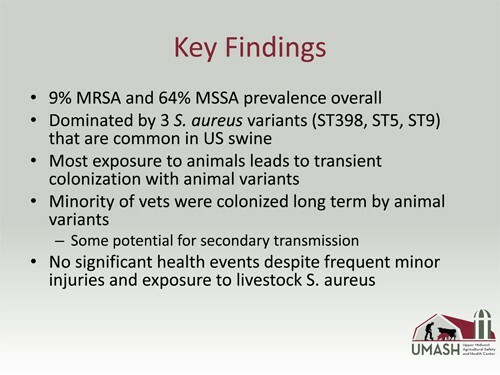 Patterns of S.aureus and MRSA colonization and infection in US swine veterinarians. 23rd Conference on Epidemiology in Occupational Health. Utrecht, The Netherlands. June 18-21, 2013. Davies P. Longitudinal study of Staphylococcus. 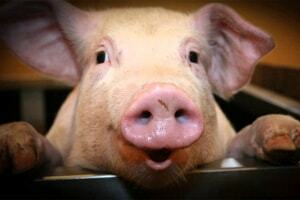 aureus in US swine veterinarians. 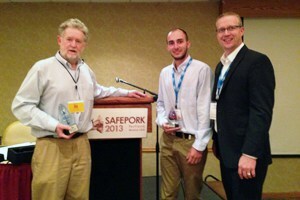 SafePork 2013. Portland, ME. Sept 9-12, 2013. Sun J. Genetic diversity of ST5 Staphylococcus aureus isolated from swine veterinarians in the USA. SafePork 2013. Portland, ME. Sept 9-12, 2013. Davies P. Livestock Associated MRSA: Tiger or Pussycat? Leman Swine Conference. Minneapolis, MN.Sept 16-17, 2013. Sun J. The evaluation of molecular epidemiological relatedness within ST5 Staphylococcus aureus isolated from swine veterinarians in the USA. Leman Swine Conference. Minneapolis, MN. Sept 16-17, 2013. 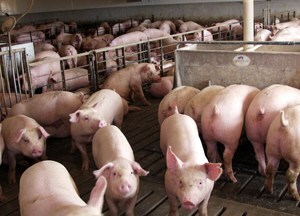 Davies P. MSSA spa types in US pigs and swine veterinarians correspond with MRSA spa types reported globally in swine. 3rd ASM-ESCMID Conference on Methicillin-resistant Staphylococci in Animals: Veterinary and Public Health Implications. Nov 4-7, 2013. Davies P. The evaluation of molecular epidemiological relatedness within ST5 Staphylococcus aureus isolated from swine veterinarians in the USA. 3rd ASM-ESCMID Conference on Methicillin-resistant Staphylococci in Animals: Veterinary and Public Health Implications. Nov 4-7, 2013. Sun J, Sreevatsan S, Yang M, Davies P. Longitudinal study of nasal carriage of Staphylococcus aureus in swine veterinarians and its implications for health. 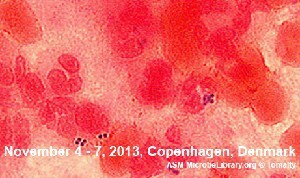 International Symposium on Staphylococci and Staphylococcal Infections. Chicago, IL. August 26-29, 2014. Davies PR, Sun J, Yang M. MRSA in the US swine industry – recent developments. Allen D. Leman Swine Conference. St. Paul, MN. September 13-16, 2014. Sun J. Quantitative evaluation of nasal carriage of Staphylococcus aureus in swine veterinarians. American Association of Swine Veterinarians. Orlando, FL. March 1-3, 2015. Sun J. Staphylococcus aureus and MRSA colonization and infection in US swine veterinarians: an 18 month longitudinal study. 4th ASM-ESCMID Conference on Methicillin-resistant Staphylococci in Animals: Veterinary and Public Health Implications. Chicago, IL. Nov 2-5, 2015.